Even when a brunch may include bagels for just six friends or family members, ordering a dozen can be the perfect number. 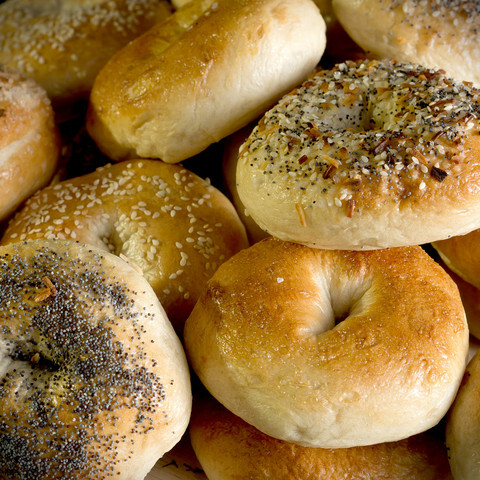 Sam has plenty of ideas for two-day-old bagels beyond simply halving them and popping each side into the toaster. Breadcrumbs — Onion and garlic bagels make great flavorful breadcrumbs to coat fish, chicken or veggies. The bagel crumbs are ideal to top-off casseroles and other baked dishes, too! Break the stale bagel into bite-size chunks and run each batch through the food processor until it’s uniformly ground. Toast the crumbs in a 350o oven for a few minutes and store in an airtight container. Best when used within four weeks. Bagel Chips — Lay the bagel flat on a cutting board and carefully cut thin horizontal slices. In a large bowl, toss and coat bagel slices with olive oil, salt, pepper and seasoning. A generous sprinkle of parmesan cheese gives them some kick! Put single layers on baking sheet and in a pre-heated 300 degree oven and bake until crisp. They’re delicious with a hot bowl of soup on a cold winter day! Be sure to ask Sam about his packaged bagel chips; they’re delicious! Pizza Bagels — Layer your favorite red sauce or pesto onto each side of your day-old halved bagel and top with veggies or pepperoni. Sprinkle with shredded mozzarella cheese and broil in a toaster over until the cheese starts to bubble. Bread Pudding — Substitute leftover bagels for stale loaves of bread. Using simple ingredients, you can make a fast and delicious sweet or savory dessert. Croutons — Cut stale bagels into bite-sized cubes. Toss with olive oil and herbs and bake on a cookie sheet for 350o until toasted. Add cooled bagel croutons to a salad or soup. For more ideas, visit King of Bagels at Howell Plaza Shopping Center and ask the new owner, Fady, in person.